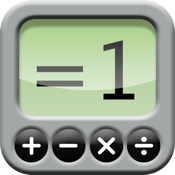 Make the result of expressions to "1", by changing the operators "+, -, ×, ÷". Those operators can be changed by tapping. 3. Displaying hint function by tapping "=" once. 6. The last solved question is displayed while pausing. When a question has been solved accidentally, the user can check the correct answer by pausing the game. If you like No.1 (free version), please try advanced version. Here is a brief manual of No.1 Advance. 1. A hint can be shown by tapping "=" once. 2. The question can be passed by tapping "=" again. Correct answer will be shown. The game can be continued by tapping again. 3. The game can be paused by tapping around "Time" and "Score". (Lower part of the screen.) Last question will be shown while pausing, so if the correct answer has been put accidentally, you can check the correct answer again. "Time Trial" mode is competed the number of correct answers in specific time. 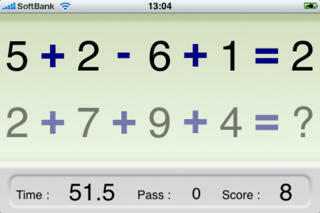 "Score Trial" mode is competed the time to solve the specific number of expressions. 60s is 60 seconds, 180s is 180 seconds and 300s is 300 seconds and 10p is 10 questions, 25 is 25 questions and 50p is 50 questions. "Free" mode doesn't have any limits, just continue solving as long as you want. Game level can be changed by tapping "Normal". "Kids" is easiest and "Hard" is hardest level.